​STUDIO4 complex on the fourth floor of 25 Main Street in Northampton, MA. We offer an array of movement therapy practices with a group of talented and innovative practitioners! You can book private or small group session by contacting the practitioners directly! Modalities include: Massage Therapy, Craniosacral Therapy, Pilates, Gyrotonic©, Myofascial Release, and dance. I see injury as the body’s inability to fully absorb life’s stresses. Although such stresses may seem isolated – like a broken bone or pulled tendon – the factors that predispose us to injury, as well as the long-term effects that injuries can have, are not reducible to a single muscle or joint. A body is the sum total of complex relationships between complex systems: healing from and preventing injury requires an understanding of these complexities from as many angles as possible. That’s where I come in. I have been interested in bodywork and movement studies since an early age. As a child I was an avid martial artist and athlete, practicing karate, wrestling, aikido, soccer, and hockey. When at age 17 I was told by a doctor that a knee injury was so severe I would never run or play sports again, it galvanized me to formally study rehab and so that I would be able to heal myself. Later, while attending Physical Therapy school at Northeastern University, I met an influential teacher of Chinese martial arts and somatics that would change my way of thinking forever. I became fascinated with the intersection of traditional embodiment practices and current Western scientific research. I am passionate about fusing these traditional and current approaches, both for my own life and in my work with others. Ultimately, the most important part of my work is helping my clients develop empowered relationships to their bodies. It’s no secret that our hectic modern lifestyles put our bodies under stress, and unless we plan on dropping out of civilization altogether, we need strategies to keep our bodies healthy and grounded in our current context. I see myself as a collaborator with my clients, working with them to situate their healing strategies around the demands of their individual lives. In this way, my clients deepen their knowledge and intuition of their own bodies, developing skills they can continue to cultivate and use to keep themselves well outside of my practice. ​Above all else, I work from a perspective of awe and respect for the intelligence of the human body. I see bodywork as facilitating this inherent body intelligence towards its capacity for regulation, comfort, and ease. I am passionate about encouraging this regulation in the body as well as about working with each person to find the doorways in, where they can initiate and connect to this capacity independently as well. Thus, my work is more interactive than a traditional massage, and operates from a place of listening and intuitive touch first, rather than directive and aggressive massage/manipulation. To me, pain and injury are symptoms of a greater challenge in the body. When, for example, someone has low back pain, it is most often not simply caused by a local issue, but connected to other areas of the body and to a person’s experience. Connecting these dots and bringing the body back to balance is thus necessary for shifting pain in an effectual and lasting way. Finding out how to do that is how I can help. My sessions draw on a combination of manual therapy techniques, including CranioSacral Therapy, visceral manipulation, deep-tissue massage, and myofascial release. I am also informed by a lifetime of movement practice and somatic inquiry. Sessions offer healing relaxation (time in the parasympathetic nervous system, where our self-healing mechanisms act at their highest potential), relief from chronic pain, and tools for mindful awareness and proprioception. I received my MFA in dance from Smith College and my Massage Therapy License through The Massage School in Easthampton, as well as completing a two year training in Biodynamic CranioSacral Therapy. I have also completed trainings in visceral manipulation and neuromeningeal manipulation. In addition, I work as a choreographer, dancer and movement educator. Jen Polins, SCDT’s Founding Director, is a curator, mobilizer, movement practitioner, and performance maker who has worked at the intersection of somatics, performance, and contemporary dance techniques for over twenty-five years. She holds an MFA in Dance from Hollins University/The American Dance Festival and is a 2014 MCC choreographic fellow. Jen has danced professionally in America and Europe, starting with the Joffrey, Milwaukee, and Zurich Operahouse ballet companies before embarking on a professional career in performance art and co-founding Wire Monkey Dance, with over twenty productions across America, Europe, and Asia. She specializes in rigorous improvisational practices and has worked closely with many mentors, most notably Nancy Stark Smith, Steve Paxton, and Lisa Nelson. More recently she has collaborated with Maurice Fraga, Joy Davis, Jen Nugent, Stephanie Maher, Peter Schmitz, Sarah Shelton Mann, Paul Matteson, and James Morrow. Jen is certified in Pilates, Gyrotonic, Gyrokinesis, yoga, and massage, and is guest lecturer in the Five College Dance Department, currently teaching at UMASS in addition to Holy Cross College in Worcester, MA. With SCDT, she maintains close collaborative relationships with the Northampton Arts Trust, San Francisco’s La Alternativa, and Boston’s New Movement Collaborative. She lives in Northampton. The Gyrotonic Expansion System is a cutting edge exercise method based on Qi Gong and yoga. 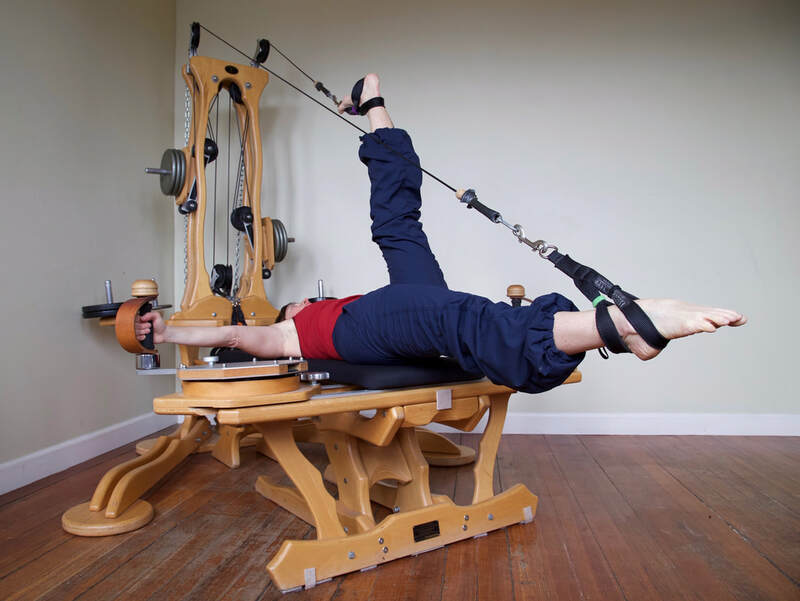 Gyrotonic offers a full body work out that stimulates the natural healing processes of the body, increases flexibility, coordination and strength. Sessions benefit a wide range of people from senior citizens looking for safe and enjoyable exercise, to athletes and dancers seeking intelligent, holistic training. Movement Resource teachers are seasoned professionals in the fields of integrative movement therapies, somatic practices and dance. To book an appointment or to inquire about classes, please contact one of our teachers. Gyrokinesis is a movement technique first developed on dancers, but is now practiced by thousands worldwide. The class organizes stretches into a series of continuous movements that sensitize, energize, and harmonize the systems in the body. Through gentle repetitive movements, our spine, shoulders, and lower body are freed from tension and chronic stiffness. Gyrokinesis provides a thorough workout that is invigorating, fun and elegant. No experience is necessary, just a willingness to try something new!